In the upstairs gallery of L.A. Louver Gallery, painter Sandra Mendelsohn Rubin is showing a suite of works that depict views of Mendocino County. 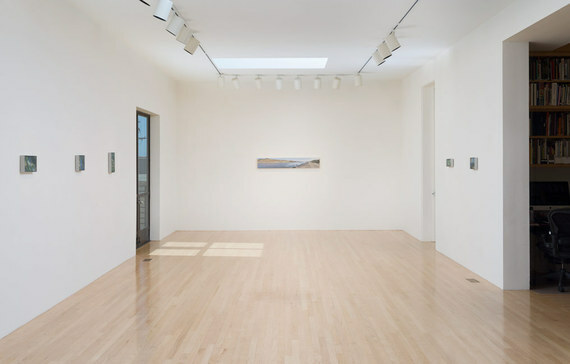 Connected by the theme of water -- which appears in a swimming pool, river views, a pond and a lake -- Rubin's paintings also form an extended painted essay on patience and preciousness. I saw the show after a morning spent driving through dense LA traffic, and the expanse of white walls between Rubin's paintings, interspersed with Rubin's faultless and serene canvases, provided a tonic for my senses. 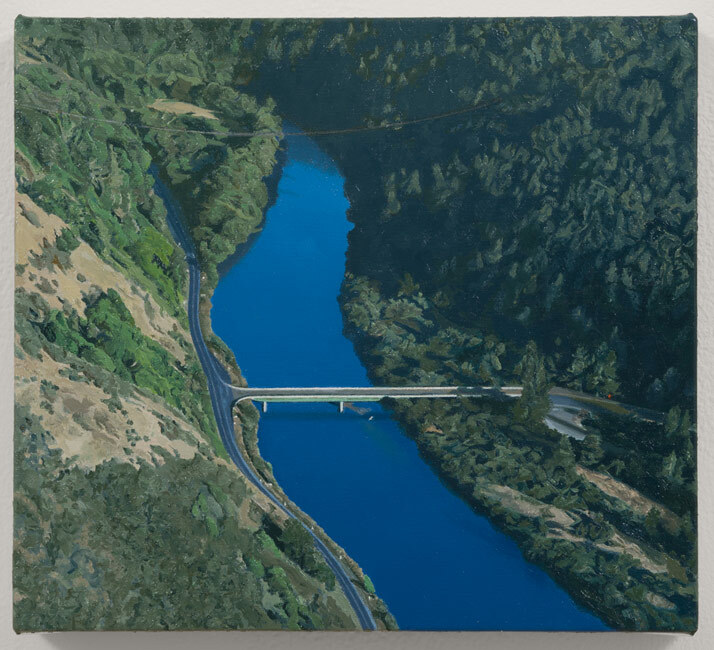 Bridge Over the Navarro, 2013, oil on polyester, 6 1/2 x 7 1/4 in. Several of the exhibition's aerial views are very small: for example, Bridge Over the Navarro is just over seven inches across. As a result, I was drawn near as I inspected the painting, only to find that at close range it suddenly felt expansive. Rubin's brushwork is uncannily perfect, and the detail of a roadside stop sign represented by a pinprick of red paint -- look for it to the right of the bridge -- made its verdant green surroundings suddenly seem vast. The two thin, straight lines defining the edge of the bridge add a note of manmade geometry that provides a counterpoint to the blue river's serenity and meandering natural presence. Aqueduct at Quail Lake, 2014, oil on polyester, 9 x 54 in. After looking over some of Rubin's smaller paintings, her Aqueduct at Quail Lake, which is five and a half feet wide by nine inches tall, felt like a mural. It is a magnificent painting -- one of Rubin's very best -- that is remarkably spare and disciplined. The prevalent greens of Rubin's aerial works falls away as this work presents a study of rippling water wedged between dry, rocky triangles of tan and grey earth. I took a long time looking at this painting, knowing that soon I would be back in my car fighting the rush hour traffic again. I wanted to be in the place of the lone figure fishing the aqueduct's rippling waters, soothed by a view of cool blue water and waiting for a fish to bite.